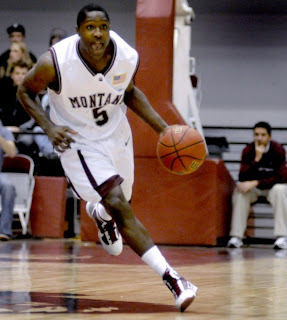 For anyone looking for information on Montana, definitely a sleeper in the NCAA Tournament as they take on Wisconsin. A brief look at the players that make Montana a potentially dangerous 13 seed. Will Cherry (JR) - He is the Defensive Player of the Year in the Big Sky, and arguably one of the best perimeter defenders in the country. He takes great pride in his defense, and is a master at getting steals (he should finish his career at the Big Sky career steals leader). Offensively, he has an improving outside shot, and has good explosion on his drives. He can get at least a decent look almost whenever he wants. He tends to make big plays at the biggest moments, as he definitely showed down the stretch. He is the team leader, and is a very emotional player, which rubs off on everyone else. Kareem Jamar (SO) - Jamar has taken a big step forward this year, and the argument could be made that he, and not Cherry, is the Grizzlies best player. 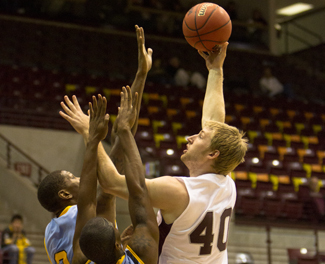 He was great in the championship against Weber State, and finished as the Grizzlies second leading scorer, second leading rebounder, and leader in assists. He shoots 48% from the field, including 45% from three-point range. He is a varied offensive player that can shoot from the outside, drive, or post up smaller guards. He is also the best passer on the team. He has an extremely bright future. Art Stewart (SR) - He is the consummate glue guy who does a little bit of everything. Most of all, he adds a lot of toughness to the team. He is a very good defender, and does all of the little things for Montana. Offensively, he picks his spots well, as he very efficiently averaged 9.2 PPG. He can take it inside, and his outside shot is just good enough to keep people honest. Mathias Ward (JR) - His offensive development has been a revelation this year. He was a solid spot-up shooter in the frontcourt last year, but this year he has become one of the best offensive weapons, as he showed in the championship. His midrange game is probably better than anyone else in the conference, and he shot 55% from two this year. He also has enough range to hit a three. He is not a great rebounder or defender, but he does just enough that he is not a big liability in those areas. Derek Selvig (SR) - He is possibly the most unique center in America. He is one of the best passing big men I have ever seen, and has very good ballhandling skills. His scoring is down this year, but he has instead focused on the glass and interior defense, where he made big strides this season. Offensively, he can hurt you in a lot of different ways. He is a very good three-point shooter, off the drive, posting up, or finding the open man. His skill set will be tough for Wisconsin to gameplan for. Shawn Stockton (SR) - They don't rely much on their bench (they played their starters all 20 minutes in the second half of the conference championship), but when they do Stockton is usually the guy that enters first. With 15.6 minutes per game that was more than anyone else off the bench. He has struggled with his outside shot this year, making just 13 of his 54 threes. He is more of a combo guard because he is not a natural 1, but Tinkle likes him because he brings the attitude of a senior to the floor. Keron DeShields (FR) - They have three freshmen wing guards, but DeSheilds has been getting the most time lately (Kevin Henderson and Jordan Gregory are the others). He has a lot of potential on the offensive end, but gets a little too eager at times, like freshmen are want to do. Mike Weisner (FR) - The redshirt freshman is their first big man off the bench, even though he has the body of a small forward. He had some big moments against Weber State in the regular season finale, and flashed some solid potential. He has a nice outside shot (though he has only made 5 threes this year), and is a good passer.